It may seem intimidating, but porchetta isn’t all that difficult to prepare and the rewards are well worth your effort. 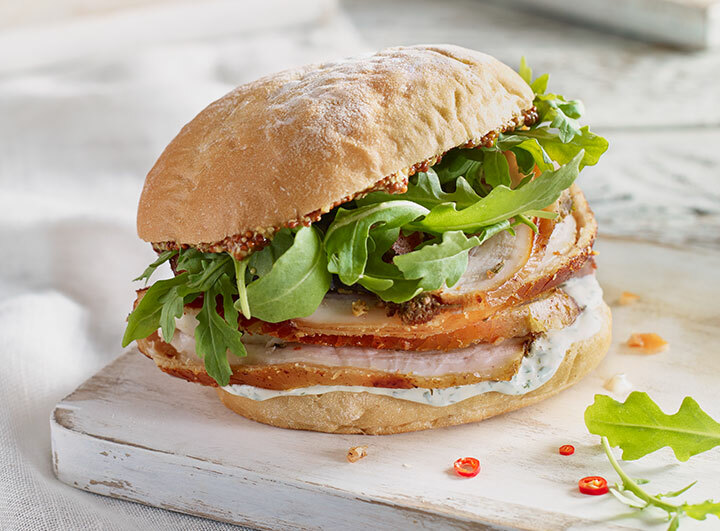 Essentially, it’s pork belly wrapped around pork loin, but when it’s seasoned just right and roasted until the outer layer develops a salty pork crackling crust, the resulting combination of textures and flavours are anything but simple. Mike from Tenderland Meats adds fresh sliced figs to his version of the traditional Italian roast, and with quality ingredients, shows us how to elevate a sandwich to gourmet status. Preheat the oven to 500℉ (260℃). In a small skillet, toast the fennel seeds and chilli flakes until fragrant. Remove from heat and grind in a mortar and pestle or electric grinder. Combine the ground fennel mixture with the chopped rosemary, oregano, and garlic, and set aside. On a board, place the belly skin side down, and score the flesh in a checkerboard pattern about ½-inch deep. Turn the belly over and pound the skin all over with the jagged edge of a meat tenderizer. Turn the belly over again, season generously with salt, and rub over the reserved spice mixture. Arrange the fig slices down the middle of the pork belly. Now place the pork loin on top of the figs and wrap the pork belly up and around the loin. Tie the roast at ½-inch intervals, looping your twine or, if it’s easier, tying each section individually. Allow meat to come to room temperature before roasting and season the skin generously with salt. Place the roast, with the belly seam side down in a shallow roasting pan or baking sheet and roast for 40 minutes. Reduce the heat to 300℉ (150℃) and continue roasting for about 1½ – 2 hours more or until an instant-read thermometer inserted into the centre of the meat reaches 160℉ (71℃). Spoon off the pork fat from the drippings and allow the roast to rest before slicing. Mix together the mayonnaise, parsley, and a squeeze of lemon. Slather onto the bottom of the bun. Place a generous amount of the porchetta on top, making sure to include some of the figgy-herb filling and drippings. Then place a few slices of fresh fig on top. Spread the grainy mustard on the top bun, add the arugula, close up the sandwich and dig in!